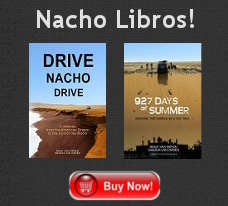 Drive Nacho Drive » We Did It! We made it! Our 3-day donation drive brought in ,120 for Nepal! And before I get nine thousand emails on the topic, I realize there’s a typo (write-o?) on the check. This is the first paper check I’ve written in 10 years, so it was bound to happen. Rest assured, there aren’t twenty dollars floating around in financial deep space. 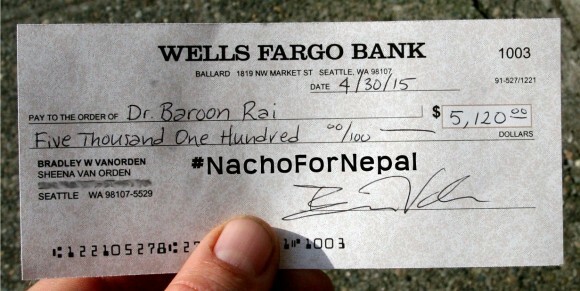 The funds have been transferred, and Baroon departs today (Friday). To all 77 of the donors: THANK YOU! I know the concept of changing a life gets thrown about all too often these days, and it has sort of lost its significance. But in this case I can say, without a shred of hyperbole, that together we’ve changed the lives of lots of people in Nepal. As a result of your generosity, people will receive much-needed medical care where they otherwise wouldn’t have. People will avoid infection and live instead of dying, they may keep their limbs. That’s really something. If you haven’t already, I hope that one day you may travel to Nepal to experience firsthand these wonderful people, their cultural treasures, and their awe-inspiring mountains. If any more donations trickle in, we’ll be sure they get into the right hands (but I would encourage you to donate directly to a charity from here on out, as it will probably get there faster).